Officials are changing the red numbers on their jerseys to white ones. If you were planning on being an NBA referee for Halloween and already bought your costume, I’m really sorry, but your gear is out of date. League official Bill Spooner took the floor in Thursday night’s Knicks-Celtics preseason game with his No. 22 showing a little brighter than it had during his initial preseason contests. Instead of showing off a red 22 per usual, Spooner’s digits were in white. White? White, you say? 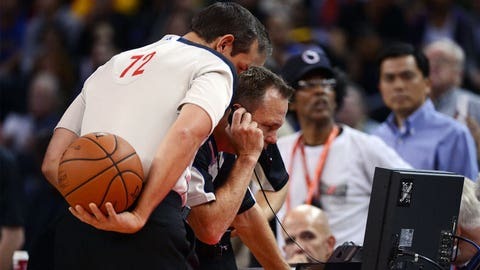 But how could the NBA make such a change to the referees’ uniforms after already introducing new unis for this season? The answer is clear: NBA officials are making more wardrobe changes than Cher at the Bellagio. Referees will now wear the white numbers instead of the red ones moving forward. A league source told FOX Sports that the NBA wasn’t a fan of the red ones, which "did not show well." Because of that, all officiating jerseys will have white numbers starting opening night, the source told FOX Sports. And now that the refs are looking good, let the season begin.